New beginning for everyone! The Survivors are no more, Bella Quinn controls the XWA, giving us the first reasonable authority figure in a very long time, all is well in the world. So, what next? Well...that's up to you! Since 2016, we ran the Survivors arc (technically it began in late 2015 if you want to be nit-picky) and though there were things like ELITE and Minka Carter and Tim/Barnez running at the same time, the arc was a quite all-consuming. But now, without that, it's the opportunity for a completely fresh start for everyone. Years ago, in the not-so-ancient days of XWA, we didn't have fed-wide stories like the Survivors. Well, not immediately. Things like the Faction War were born out of us going with the flow of stories and angles and characters created by YOU. So now, in 2018, we want to bring that back. Sometimes, I will be asked by people "who can I feud with right now" and my answer is usually a variation upon "that's up to you". Because it is! Totally and utterly. It's not like other feds- we won't put you together with others ourselves and force you into a feud. Our booking philosophy has always been to book towards what YOU are doing with your character. 2018 is a brand new start for all of us and here is my challenge to you- make it the year of YOUR character. if you want your character to stand out, take the bull by the horns and make us notice! If you see someone and you want to feud with them, get a PM sent to them and set something up then let us know it's happening! If you have an ace storyline you wanna tell, go tell it- it's why we encourage you to do your own promos and Character Development. And if you don't have any of those things answer an open promo! If there isn't one, start one! Shock. Amaze. Be Creative. Stand Out. Make people talk about YOU. 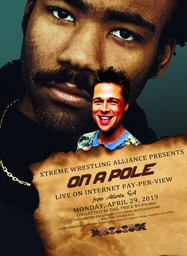 The XWA is YOUR World Now. Treat it as such! Bumping this because it warrants repeating- we book based on what YOU give us. Don't just Tweet- do promos, come up with feuds, collaborate! Guys, this is your fed- TREAT it as such!